First Thessalonians 5:23 indicates that we are tripartite, or, of three parts—spirit, soul and body. Hebrews 4:12 mentions the spirit and soul, and the dividing of these two parts; if we would know Christ and enter into Him as our good land, we must discern the spirit from the soul. In Luke 1:46, 47 the soul and spirit are again distinguished. Luke 1:46, 47 And Mary said, My soul magnifies the Lord, and my spirit has exulted in God my Savior. The mind—the part in the soul that knows, considers, and remembers. 2. 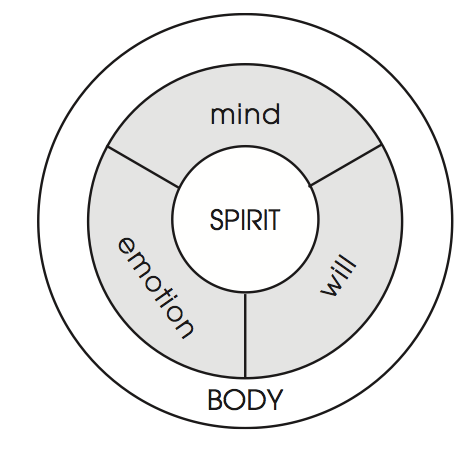 The will—the part in the soul that makes decisions: chooses, refuses, and seeks. 3. The emotion—the part in the soul that expresses: love, hatred, joy, grief, desire. 4. These verses establish the ground to verify the three parts in the soul—mind, will and emotion; these parts cover all the functions of the soul.